"Why This Is One of the Best Nonprofit Annual Reports I've Ever Seen:"
“Click here to read one of the best annual reports I’ve ever seen...” began the e-newsletter a client had forwarded to me. So began my introduction to Jim Mueller, a national nonprofit consultant with 35 years experience – including senior/executive management positions with Cornell University, Northwestern University ($30 million endowment campaign), Advocate Healthcare ($3.1B bioethics think-tank) and Goodwill Industries of Metropolitan Chicago and Northern Illinois, among others. Read more about Jim and how he helps nonprofits as a consultant, further on in this article. But suffice to say, Jim knows annual reports. I requested an interview with Jim to find out what made KID’s annual report good, why it worked, and – the million-dollar question – his take on paper vs. digital. Jim’s no-nonsense answers will surprise you. The Loyalty Letter (TLL): How did you come to see and write in your e-newsletter about KID’s report? TLL: What were the key elements, when you read KID’s annual report, that really stood out to you? Jim: It’s extraordinary on many levels. It’s inviting. It tells a story in a meaningful way – and helps people understand what Kids in Distress stands for. 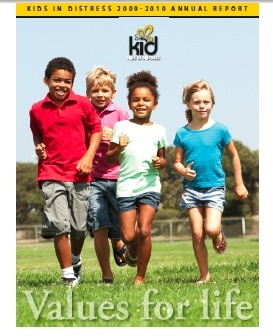 Core values are the heart of an organization, and the stories in KID’s annual report are tied to every one of their core values. The programs are tied to every story, and the metrics are still there in the sidebars. The pictures work well with the values. It connected all the dots in an interesting, inspiring way that leaves the reader intellectually and emotionally engaged. TLL: What would you improve about the report? Jim: Top of mind, I couldn’t imagine anything that would make it better. It’s the best I’ve seen. Very few annual reports achieve this – it takes a deeper level of thinking. It’s an exemplary use of a donor communications tool that shows the value of the organization’s work and its power...like a case for support in annual report form. TLL: Annual reports aren’t required for nonprofits. Do you feel they’re useful? Do you have any suggestions on how nonprofits can use their annual reports to achieve results? Jim: Annual reports tend to be “un-useful.” There isn’t enough thought behind them – there are no stories, they aren’t well designed. But when people are integrated into the cause, it reaches into their heads and hearts. KID’s annual report is hope from cover to cover. I would use it as collateral in a major gift proposal. For example, if I were making a proposal for a $25,000 gift, I’d include this annual report because it tells the story that I want attached to that proposal – and it gives the proposal more weight. I’d use the report in a board meeting, to show what we’re doing in the community. I would give it a great deal of use as a tool to deepen relationships with donors. TLL: What’s your feeling on the trend toward digital annual reports? Do you think print versions are still important, and why? I did a study for a wilderness advocacy organization on whether donors would prefer to view the organization’s information online or receive a hard copy by mail. The response was overwhelmingly in favor of print – and this was for a wilderness advocacy group. When donors have a print version, they can share it with friends...leave it on their coffee tables...pull off the shelf and hand it to someone. It’s in four colors with the right typeface and font, pleasing to look at and feel. And it tells a story you can come back to. Head of James Mueller Associates based in Delray Beach, Florida, Jim Mueller is a nonprofit consultant with more than 35 years experience in the sector. During his professional career, Jim has provided strategic and creative leadership to a variety of institutions including Cornell University, Northwestern University, Lake Forest Graduate School of Management, Advocate Health Care, and Goodwill Industries of Metropolitan Chicago and Northern Illinois, among others. To learn more about working with Jim, visit James Mueller & Associates. And subscribe to Jim Mueller’s e-news by sending your request to info(at)jmuellerassociates(dot)com. 3. “Digital Annual Reports Lure Readers—And May Save Some Cash”, The Chronicle of Philanthropy, 2/20/2011. 5. Design for above annual report provided by S. Collette Design. You can receive more like it, FREE, when you subscribe to The Loyalty Letter monthly e-news, click here. Lisa Sargent is a freelance copywriter who specializes in fundraising and donor development communications for direct mail and e-mail. As head of Sargent Communications, she works almost exclusively with the nonprofit industry – often directly with organizations that use in-house and remote/outsourced creative teams. Past and present clients include Best Friends Animal Society, Shriners Hospitals for Children, Bryant University, Northwestern Memorial Foundation, Alley Cat Allies and Merchants Quay Ireland, among others. A member of the DMFA, Sargent’s articles have been featured in Mal Warwick’s Newsletter, FundRaising Success Magazine and The Agitator, and her copywriting clinic on donor thank-you letters is one of the most visited exhibits on SOFII, the Showcase of Fundraising Innovation and Inspiration. Sargent also publishes The Loyalty Letter, a free monthly e-mail newsletter for nonprofit and charitable organizations, which is read by subscribers all over the world. To learn more about hiring Lisa for on-call or on-retainer fundraising copywriting and donor communications projects, please call +001 (860) 881-7009 to get started, or email Lisa.